Back to the kitchen our iPads go. In case you missed it in earlier posts, iSkin Duo offers nice protection as it covers the back and the outer edge of the screen. And, to keep the iPad at the right angles for close and across the room viewing, the Griffin ‘Loop’ stand. There are a few options available for Shopping Lists on the iPad. Many of those are ToDo lists, labeled as shopping lists. The thought is that anytime you think of something you should pick up at the store, you create a line item for it and then check it off when you add it to your cart at the store. We were talking last week about the increase in iPads seen in the hands of shoppers at grocery stores and places like Costco. There is actually a ‘better’ plan for building your shopping list. While you still want to add things to the list that you find you need (a recipe has required items you don’t have on the shelf), but for us we reverse the process. Everything coming into the house gets a Todo item entry. Grouping the items into lists makes it easier to find later if your list starts to really grow. An important item is to enter a Due Date for those items that expire. Now, when you use the last of the item, take an action on it in your ToDo list. Using the ToDo app, you have a couple different paths to go depending on your preference. You can either move that item to a group that is just for things you need to pick up, you can change the Priority level to filter on later, or you can set the date to the current date so you view items expired when you go shopping. 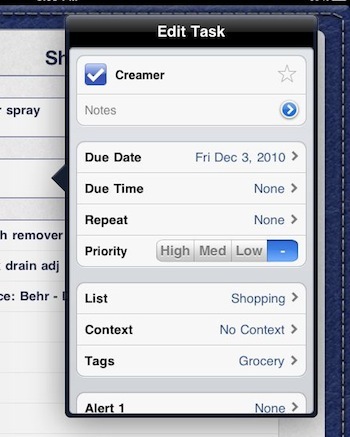 Tags are a nice way to differentiate items in a shopping list by where in the store you will want to find those items. Particularly important if your mixing your household needed items and grocery into one list of items you need to pick up. By placing an expiration ‘due’ date on things, you will get a ‘reminder’ red number on your list so you know you have items that need attention. Besides needing to be picked up at the next store visit, it is also a reminder to throw the old one away. Using ToDo as the solution for this, you don’t loose your ToDo items when the are due or past due. We like to change the ‘due’ date and then move the item into the active ToDo lists as we unpack at the house rather than in the store. It makes it more of a family fun thing to do. Of course, an added bonus is the app’s ability to sync through the cloud to other iPads and iPhones so more than one person can be responsible to pick things up that have expired or are in the ‘needed’ list. There is no need to wander the isles at the store and try to remember what was on that piece of paper on the fridge any more.